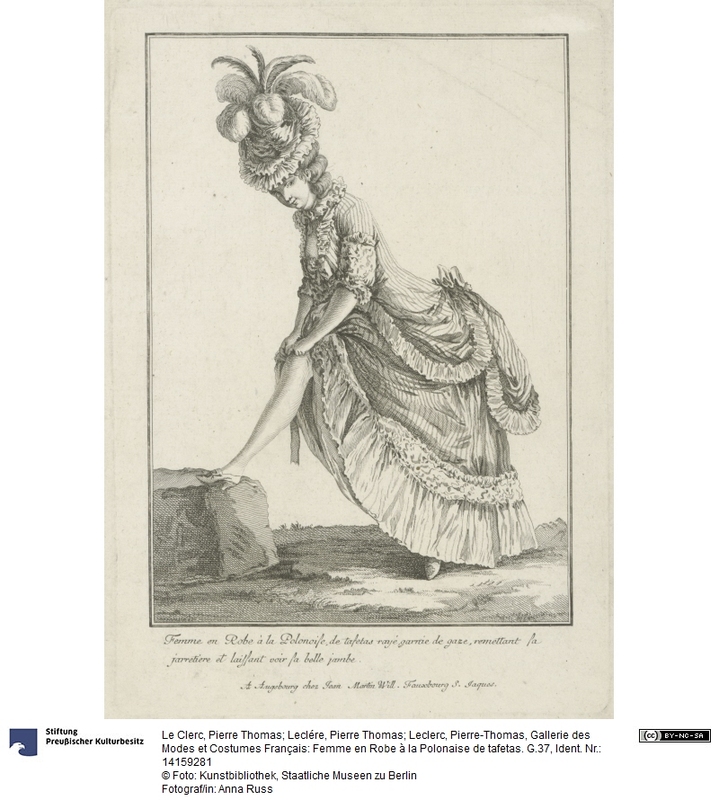 The title of the print well describes its subject: ‘Femme en Robe à la Polonoise, de tafetas rayé, garnie de gaze, remettant sa jarrietiere, et laissant voir la belle jambe’ (Woman in Polonese dress, striped tafetas, stuffed with gauze, putting on her jarrietiere, and showing the beautiful leg). In fashion, many styles bear names that talk about their provenance. This is true also for the ‘geography’ of origins of some ensembles, which were taken up and popularized in countries other from their one. The Polonaise, or Robe à la Polonaise, is surely one of these styles, whose fortune recurred at least twice in the history of western fashion. With the expression ‘Polonaise style’ we refer to a look composed by a looped-up overskirt worn over a petticoat, and a loose robe with an inverted V opening on the front. The design comes from Polish folk costume called ‘kontusz’, and was popularized around 1770 in France and in England. The reference to polish costumes mixed up with the lines of the more commonRobe à la Anglaise or à la Francaise. A variation on the robe à la polonaise was the robe à la circassienne, cut the same but trimmed with fur or tassels. The overskirt of the dress was usually gathered into three bunched swags, redesigning the silhouette in order to highlight the width of the hips. The method of suspending the fabric varied. The dress could have rows of little rings sewn inside the skirt through which a cord ran from hem to waist; alternatively, ribbon ties or simple cords sewn to the inner waist. The skirts was usually quite short – mid-calf length – and the style also featured ankle-length petticoats that revealed high-heeled walking shoes: since it was quite practical and was regarded as more ’natural’ and comfortable, it was the preferred look for walking around the city. The style came back in fashion at the end of nineteenth century, when many references to the polonaise style appeared on fashion magazines and couturiers – amongst others, Charles Frederick Worth – revived some of the lines of this style.